This historical fiction for kids is full of unexpected turns, and dramatic turnabouts. From living in Africa with her missionary parents, to pretending (under duress) to be someone else, to finally realizing her personal dream, we move with 13-year-old Rachel through time and locations with fluidity and skill. 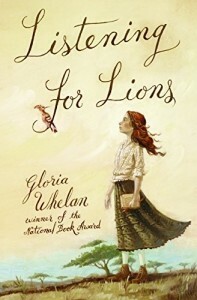 Gloria Whelan is an exceptionally talented writer of historical fiction for kids, and I have not been disappointed in any of her offerings. This one is particularly noteworthy as the plot is so unexpected. Along with the dramatic plot, we also get a beautiful look at Africa and specifically Kenya, through the eyes of love. As a fan of Out of Africa, I couldn’t help but feel my heart open as we see Africa as our heroine Rachel sees it. While it is true that we are seeing it through colonialist eyes, and not from the viewpoint of the natives who have been co-opted, still there is warmth in that vision. And the ending hints at the next step that the Kenyans will eventually take in self-determination. This historical fiction is not a light-weight story. It deals directly with sickness, avarice, lying, and homelessness. And yet this children’s book includes the utter power of truth, love, caring, and honesty as a counterpoint. Rachel is truly heroic, even if it takes time for her to demonstrate it. I would put the book at fifth grade and up, preferably 11-year-olds. It would also be superb in any classroom which might be studying colonial Africa.